Eucalyptus kruseana, Bookleaf Mallee, is a multi branched shrub reaching a height of three metres with a spread of one metre. Bark is smooth, may be grey to coppery and shed in thin strips. Bookleaf Mallee is one of the few species that never grows up. Juvenile leaves are maintained throughout the life of the species. 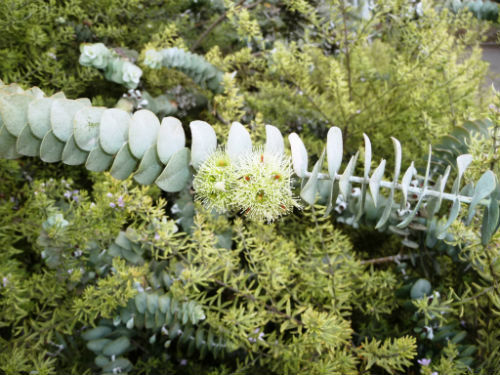 They are arranged in closely packed in opposite pairs with no stalks, rounded, smooth greyish and waxy-white. The closed packed foliage has given rise to the common name. Buds are waxy-white with cone-shaped caps. Our specimen produced buds two years after planting. Flowers are yellow-green, in clusters of seven and tend to surround the stems. Fruits are round to cup-shaped and up to eight millimetres in diameter. E. kruseana is a beautiful plant. The leaf arrangement, leaf colour and flowers are all eye-catching features. Foliage may be used in floral arrangements. This would be one of the best eucalypts for cultivation in suburban gardens. Unpruned plants may become straggly. This is prevented, once plants are established, by cutting back each stem almost to ground level. This will encourage multi-stemmed (mallee) growth. Bookleaf Mallee occurs in the Kalgoorlie area, Western Australia. The species name refers to John Kruse, a pharmacist who was born in Germany and settled in Melbourne, Victoria. The type specimen was collected near Kalgoorlie in 1909. The material was collected by Henry Deane who was surveying the route for the Transcontinental Railway. He was engineer in charge of the project. 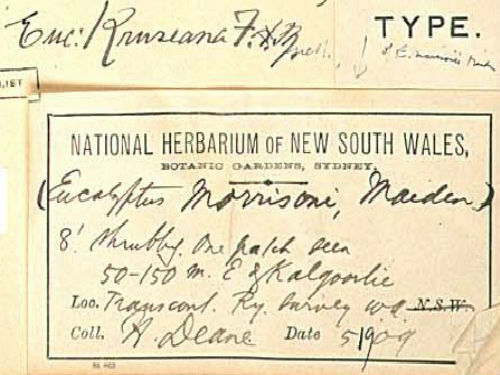 The lower image shows the herbarium label from the type specimen. At that time the species was known as E. morrisonii. A potted biography, of Henry Deane, may be found on page 3 of the Garden Diary section.